15 coolest interactive floor projection games awaits your exploratation! Nowadays, you can see various kinds of floor projection games in commercial indoor playground, a pediatric waiting room, gaming zones, or a birthday party. Usually, children have a low attention span, which disables a long-time engagement. Considering this, those indoor play parks have to come up with some interactive contents to get a total engagement of the child. Fortunately, the interactive floor projection will help solve this problem. With the technique of interactive floor projection, you can provide a wide variety of interactive games for kids. 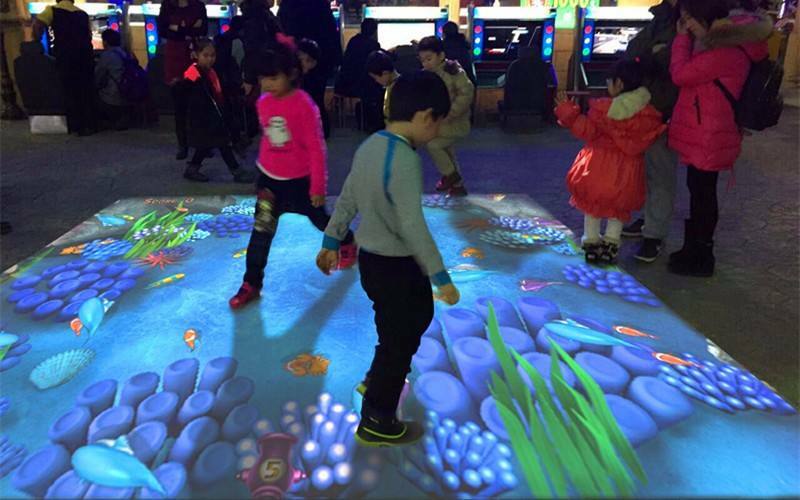 As a matter of fact, indoor interactive floor projection games are becoming more and more popular among young kids. Since interactive games can create a fun social atmosphere for children, it can bring kids lots of physical activities. While playing interactive games, kids can enable themselves to learn, socialize, and have fun in various ways. In the next, we will introduce 15 coolest interactive floor projection games to you. Hearing the game name, you may have already known why this game is considered as one of the coolest interactive games. During the holidays of Christmas festival, you can provide your customers with this interactive game, of which the main character is the Santa. In this game, you can see the Santa having fun on the ice rink. You can spread candies toys together with Santa by step on the interactive area. While playing in this game, you should watch out not to step on Santa. If you did that by accident, you will send Santa spinning out! Million years ago, the earth is filled with hundreds of thousands of dinosaurs. But an unknown event happened at that time, and it causes the extinction of the dinosaurs. Seeing lively pictures that consist of Jigsaw Puzzle pieces, kids can travel back to a prehistoric time to play with dinosaurs. In this game, players need to gather the pieces of the puzzle to bring back the Dino World. Also, kids will have the chance to meet cute young dinosaurs in the Dino World. Through this interactive play, kids will come across various kinds of challenges and funny stories. Taking an adventure to a mysterious forest by flying through this mysterious area. Once the child has stepped into this interactive area, he or she will see many fireflies flying in the dark. And this scene will inspire his or her curiosity about this unknown world. To win a higher score, children have to gather as many fireflies as possible by stepping on them. Also, make their fireflies fly as higher as they can also help them gain better scores. However, in this beautiful scenery, players have to stay careful to avoid the attacks from colorful glow worms hidden in the dark. Sure, trying to catch fireflies, as well as ducking from the attacks will make children a thrilling experience. Usually, kids are always dreaming of being a pirate and having an unprecedented battle on the sea. Then, the Gold Kings will offer those kids a chance to board the battleship and fight for the Pirate Kings. Your team names Long John Silver, meanwhile rival like creatures in the ship of Blackbeard will be the enemy you have to defeat for a victory. To win the game, you have to fire all the cannons on your ship to send your enemy’s ship to the bottom. During the game, all of the team members have to burn their wisdom to outsmart their enemies. As a result of this, this game will help kids develop their skills of cooperation and creativity. The trick or treat game sounds not strange at all for young children. In this trick or treat game, there are multiple kids are taking an adventure to reach the candy castle. You have to help those kids expropriate the “bad pieces” of candy from bags. Throughout the whole adventure, those kids squeeze in an old pumpkin camper van to dodge the attack from the evil ghost. In order to help those kids reach the candy castle, you should negotiate with your partners to stomp out those evil spirits. In this interactive game, you can see all kinds of Zombots moving at different speeds towards you. At the same time, your medical team is looking for emergency treatment. In this case, you have to step on the Zombots to disintegrate their offense. Since at different time points, the number, as well as the speed of Zombots may vary. You have to master your pace to eliminate as many as Zombots as you can. During this game, you have to catch the alien or scientist popped up at every hole. If you catch one successfully with one hit, you will earn yourself one point. While one character popping out of a certain hole, you have to jump from one end of the board to a certain hole to catch it. Through this process, kids will learn to coordinate their feet with their thoughts. While you are busying in jumping from one to another, it can encourage a quick reaction time. Put on your diving gear and catch those fishes roaming in the sea. Also, try to catch those big ones, which will bring you a higher score. If you want to earn yourself the honor of undersea hero, you may have to try your best to catch as many fishes as you can in the least amount of time. However, catching a big fish usually have a bigger random probability than catching a small one. In this game, you can see plenty of bubbles floating throughout the land, which refers to grassland, ice land, or forest land at the corresponding levels. Once you have got enough points, you can move into the next level. At every level, you can get different bonus points, as well as go through various beautiful scenes. Except for the beautiful backdrops, players can also enjoy the soothing music that helps them relax. During this game, children will have to keep on jumping off the ground until they get the stars. After starting your game, jelly or chocolate in different shapes and colors will come constantly into your sight. The only thing you have to do is to squish everything you can see on the floor. Just keep on jumping from one candy to another to clear the board. Also, you shouldn’t ignore the limited time shown on the screen and you have to stamp as many candies as you can to make a new record. What’s more, this game has a real-time background which can provide you extra fun. While playing, you can also enjoy the enticing music which can give you a good spiritual experience. Stamping adorable candies, going through fruitful scenes, as well as enjoying enchanting music will all give you a satisfactory experience. In this game, your character is the guarder of the castle. During one level, hundreds of fire breathing dragons will step closer and closer to your castle. Once a certain amount of this kind of dragon gets in your castle, your castle will collapse while means you lose the game. As the dragons approach the castle, they can instantly change their color and quantity leading to a bigger threat. In order to get to the next level, you have to step on these dragons fast to send them spanning out. This game behaved well in recent years. During this game, players will get more and more eggs and candies brought by the cute Easter bunnies. However, you should watch out that the bunnies will get angry sometimes. As a result of this, these bunnies may grab back all the presented treats and eggs. Considering this, players have to move quickly to collect those treats and eggs to get a higher score. In the game of Frogz, there are many frogs leaping from one lily pad to another one. To earn one point, you have to keep on leaping from one lily pad to the next one. So, you can catch the frogs and drive them into the pool. Generally, the key to getting a high score is to focus on those silly frogs and step on them at their passing. Through this process, you can test out whether you have a quick reaction time or not. A chipmunk named Nicky went camping with his families. When his families went for a hike, Nicky found that squirrels are stealing their supplies of Hazelnuts. So, your mission is to help Nicky fight with those greedy squirrels to get the supplies back. While selecting the correct group of Hazelnuts, you have to pick the one who can solve the given equations. Interactive floor projection games empower children to explore the world in a happy and healthy way. In an interactive environment, kids will amuse themselves for hours through those fun interactive games. Usually, you can always get the exact game you want from those suppliers of interactive projection games. They have a wide range of interactive games for you to choose from. In fact, it is pretty easy for owners to get such kind of interactive floor projection games for their indoor playground. Because only a few things will be needed!